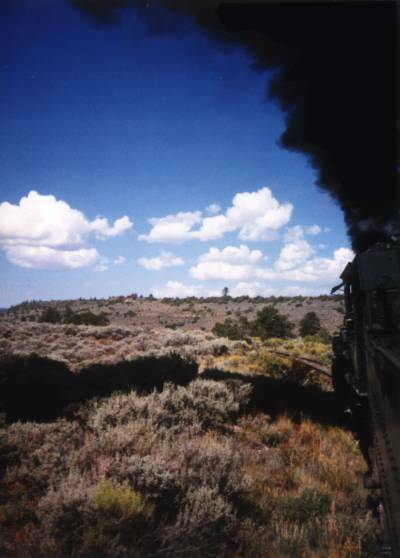 The living things that are steam locomotives? The "take a trip back into history" atmosphere? 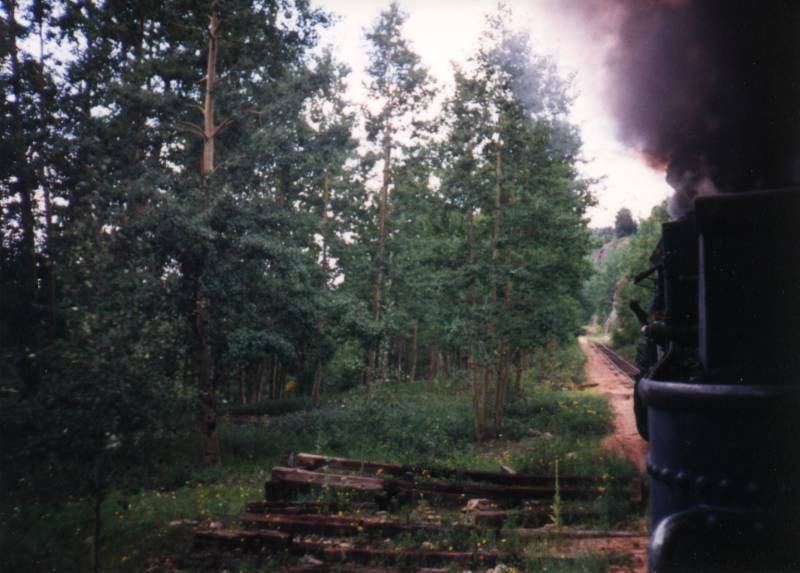 Whatever the hook, a steam locomotive is something special. 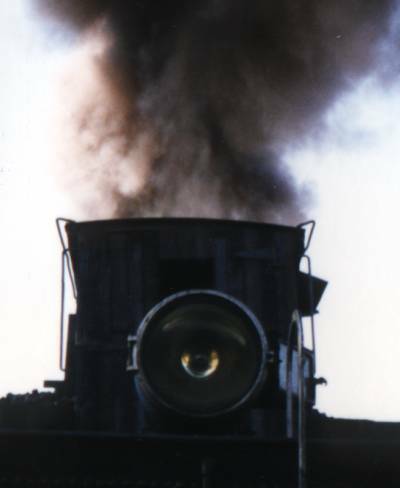 While they aren't commonplace in the U.S. these days they do remain in operation. 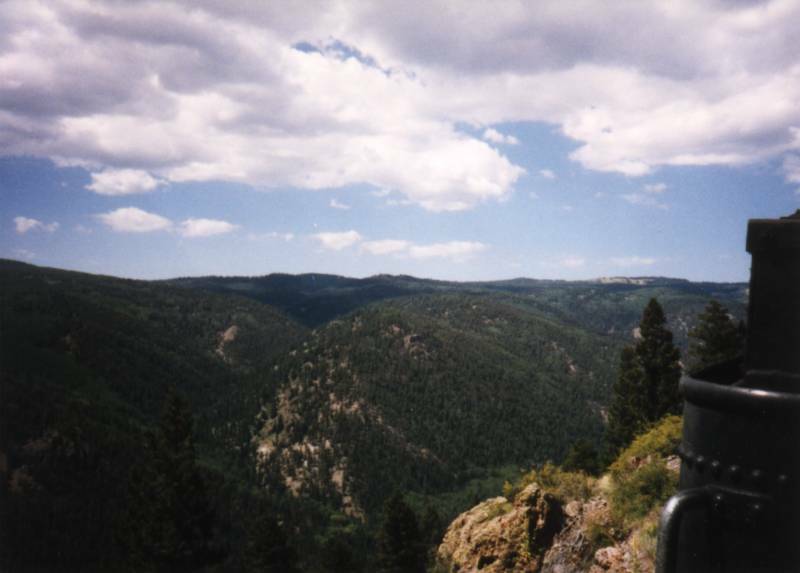 Knowing where to find'm is the key! 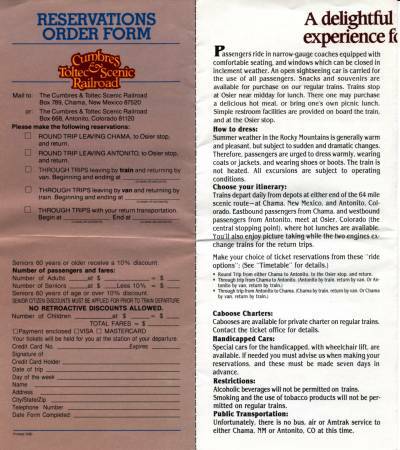 My key is a copy of the "30th Annual Steam Passenger Service Directory" that was gifted to me. 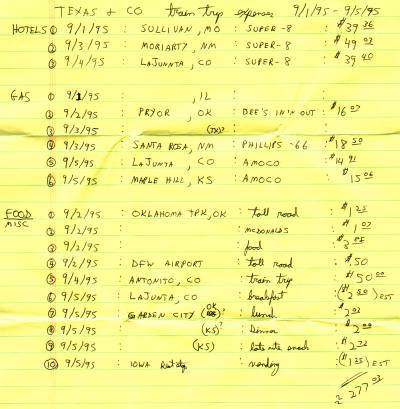 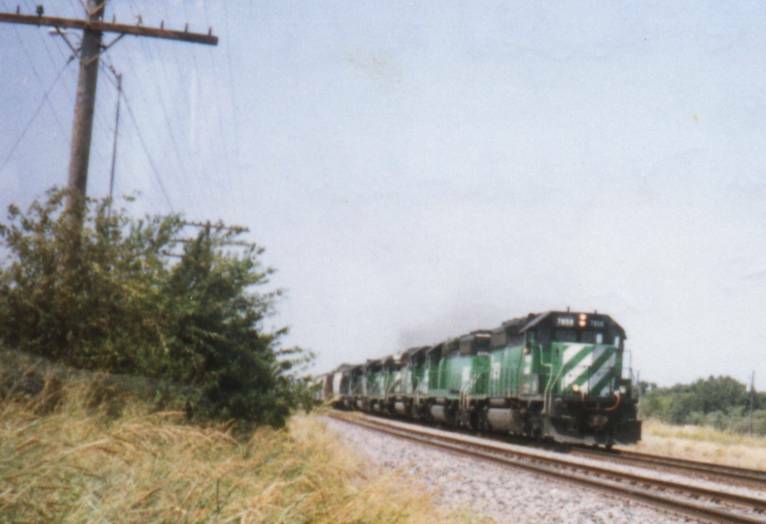 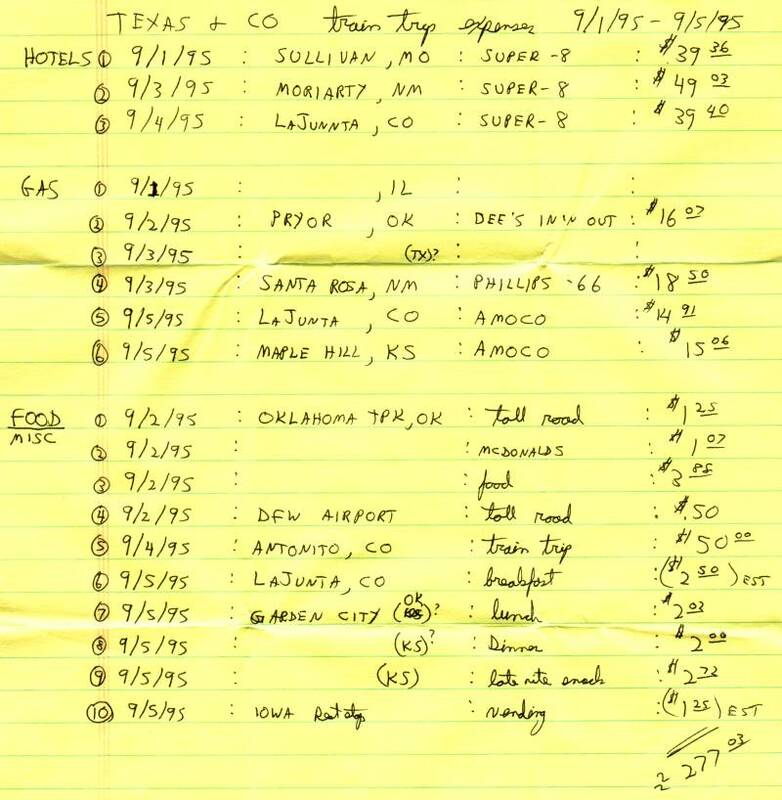 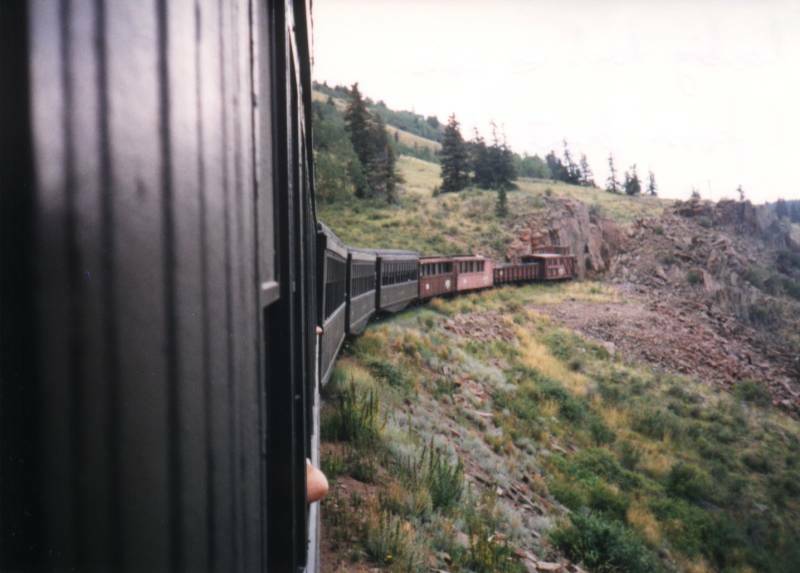 It's a wonderful list of trains in North America and gave me the kick to plan a "train trip". 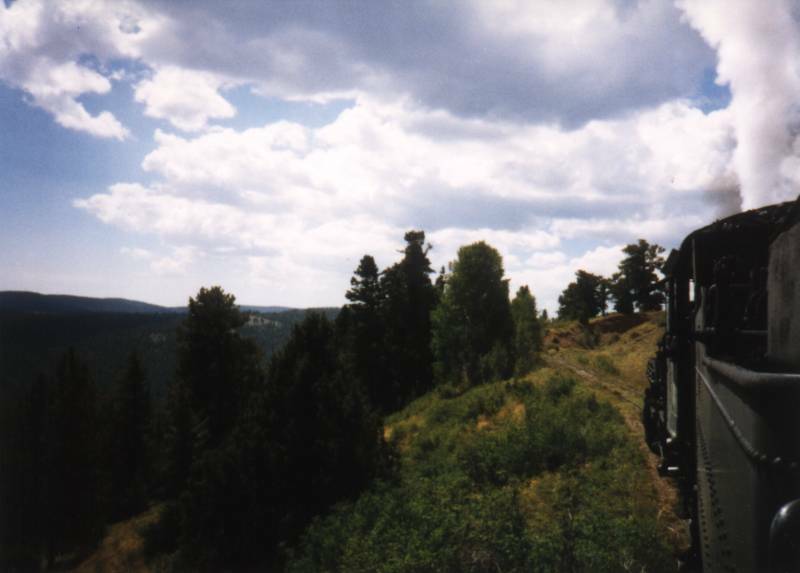 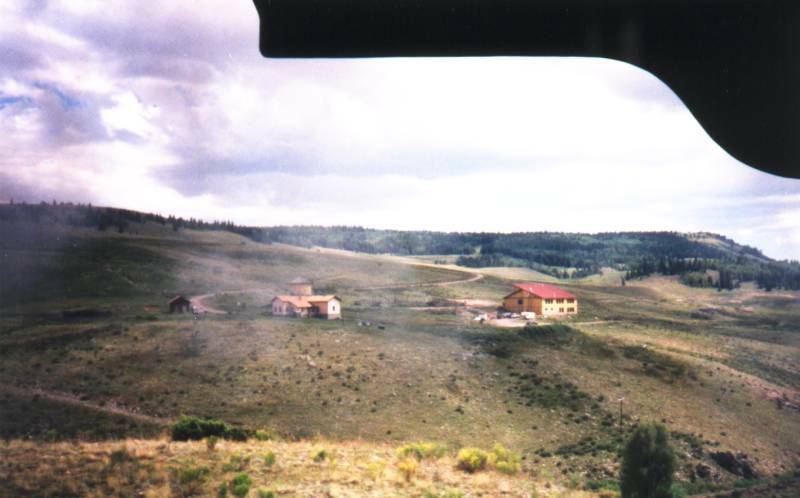 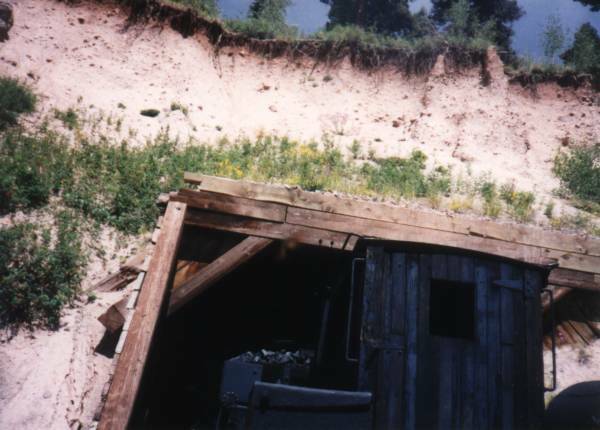 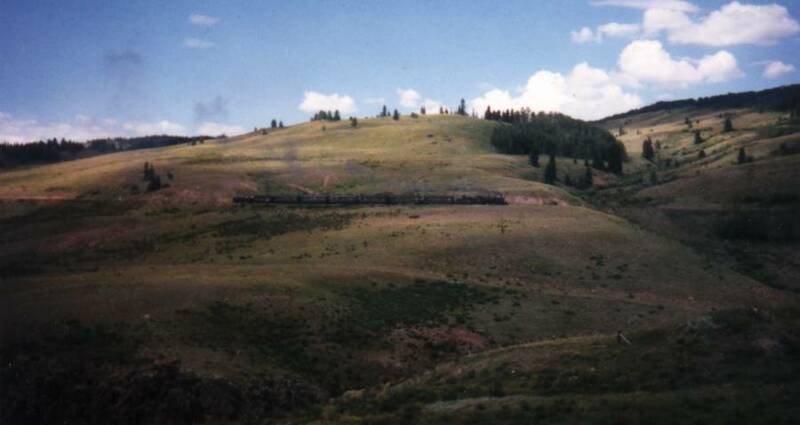 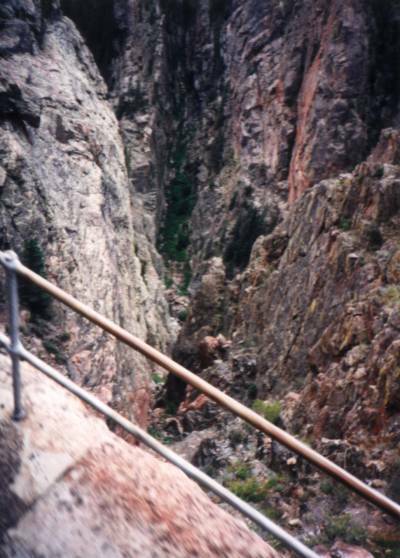 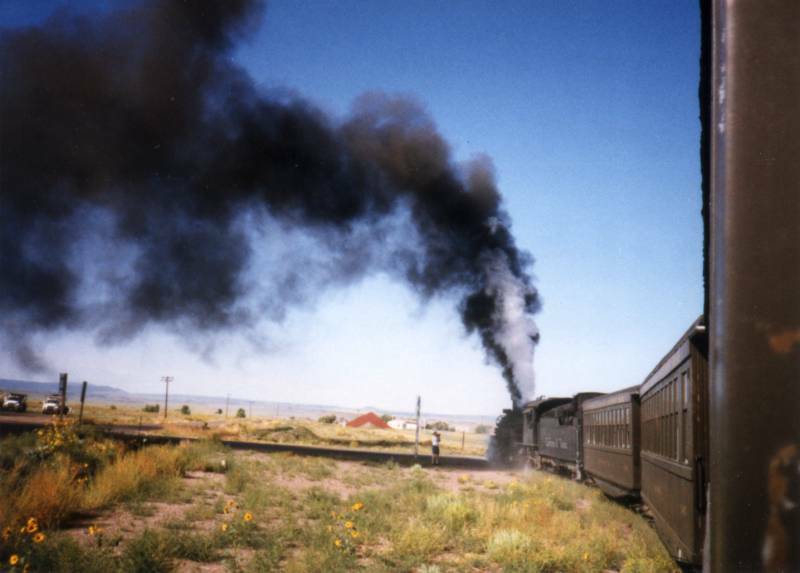 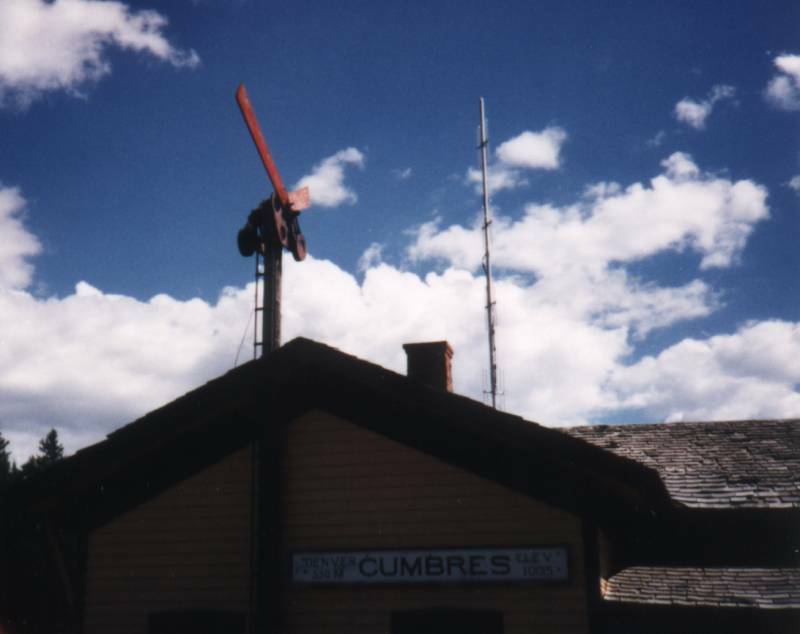 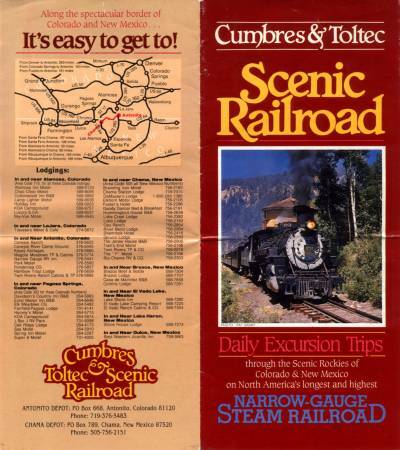 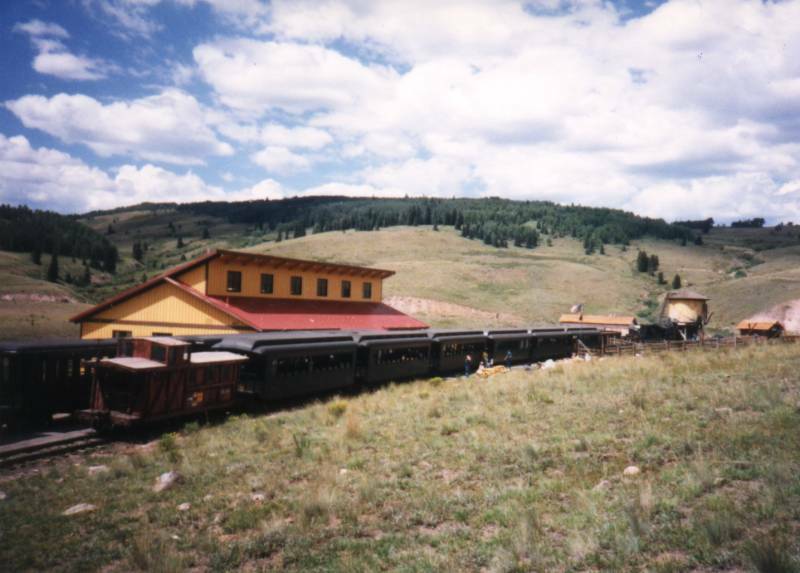 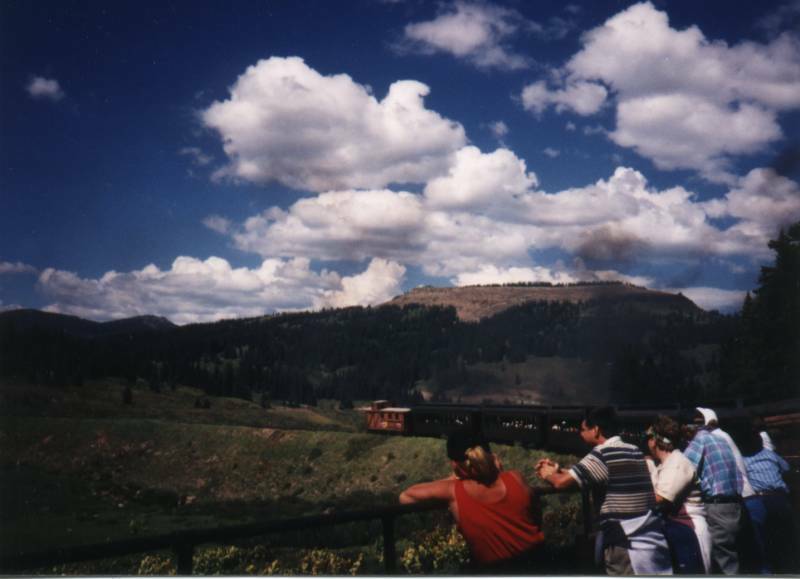 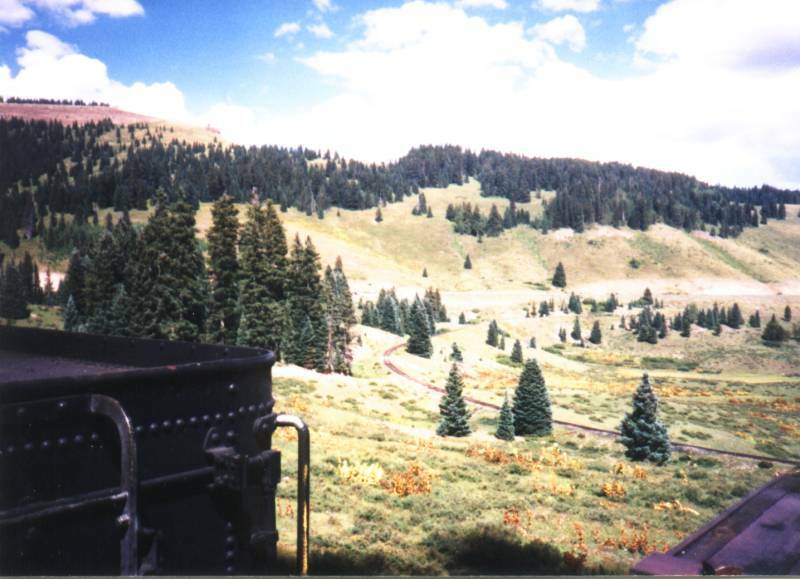 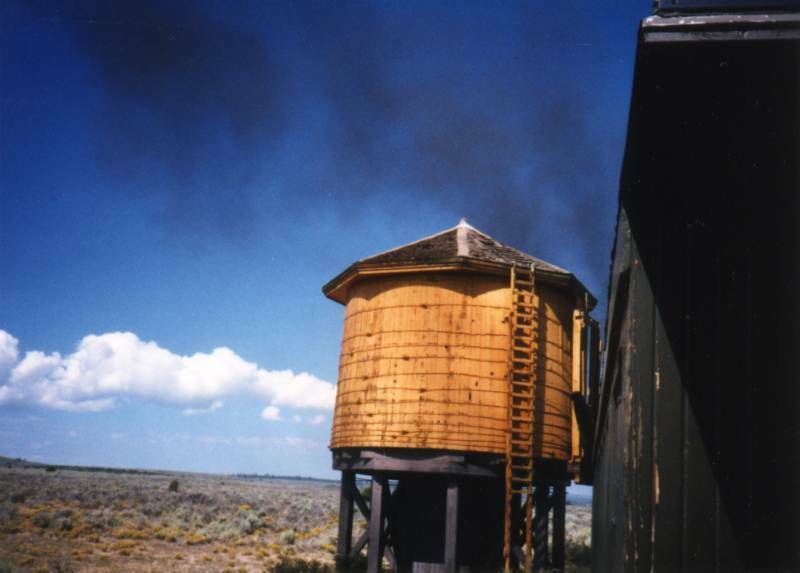 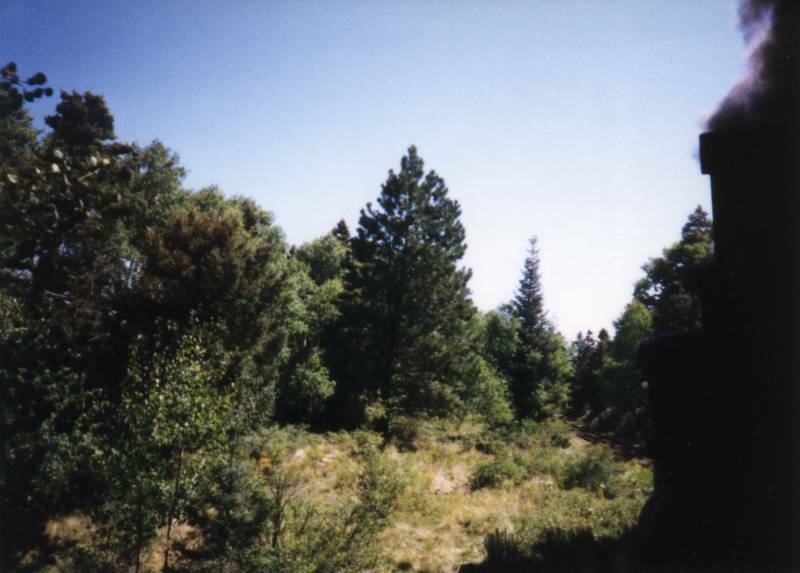 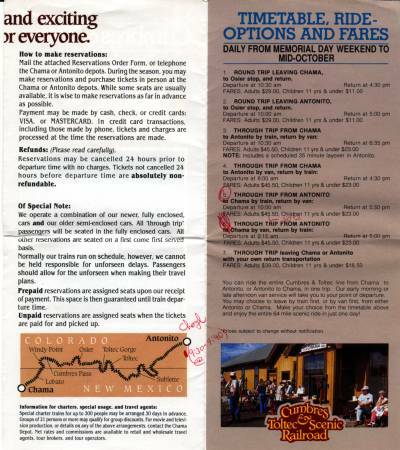 The Cumbres & Toltec Narrow Gauge Railroad runs between Antonito Colorado and Chama New Mexico. 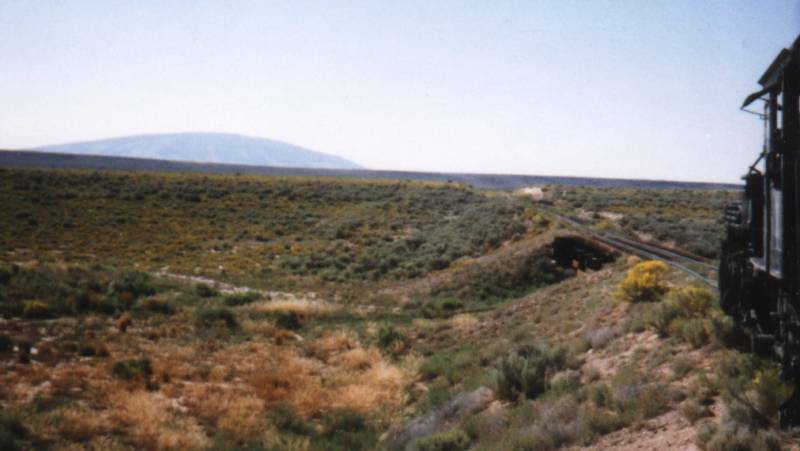 It's a remaining section of the long defunct Denver & Rio Grande rail road. You can start at either end, travel to the mid-point (the Osier lunch house) and return or you can travel through from either end and use their supplied bus for the return trip.The latter is my schedule - A through trip from Antonito with a bus return. 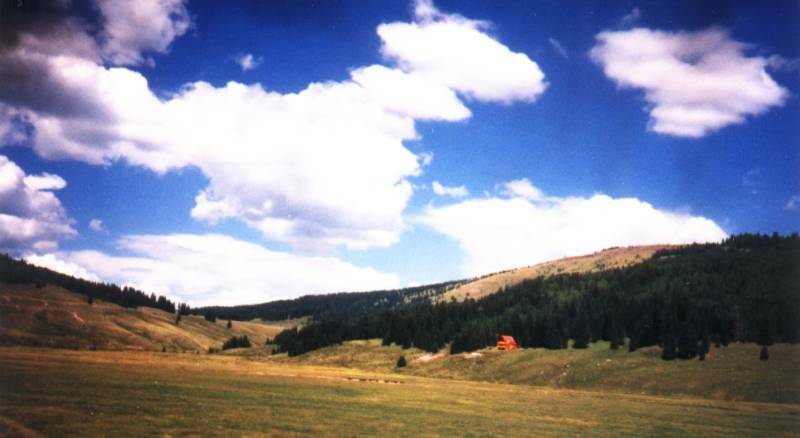 The weather was great - blue sky with some puffy white clouds. 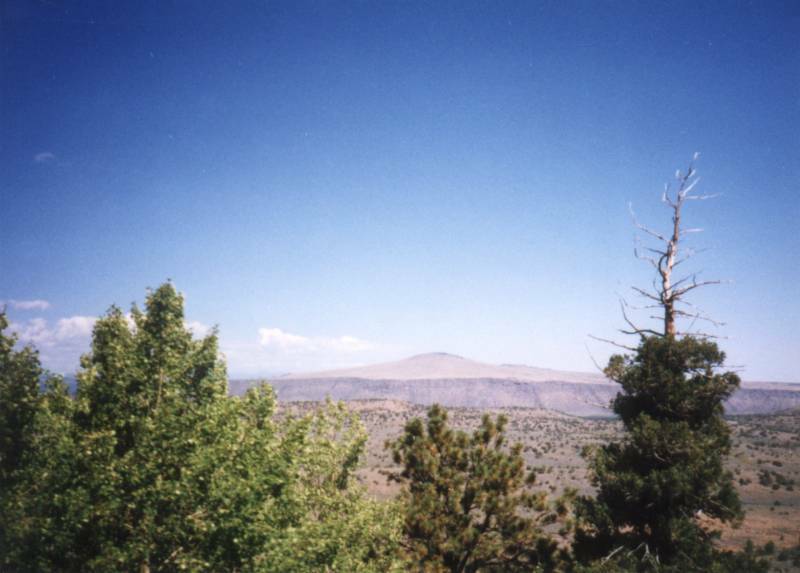 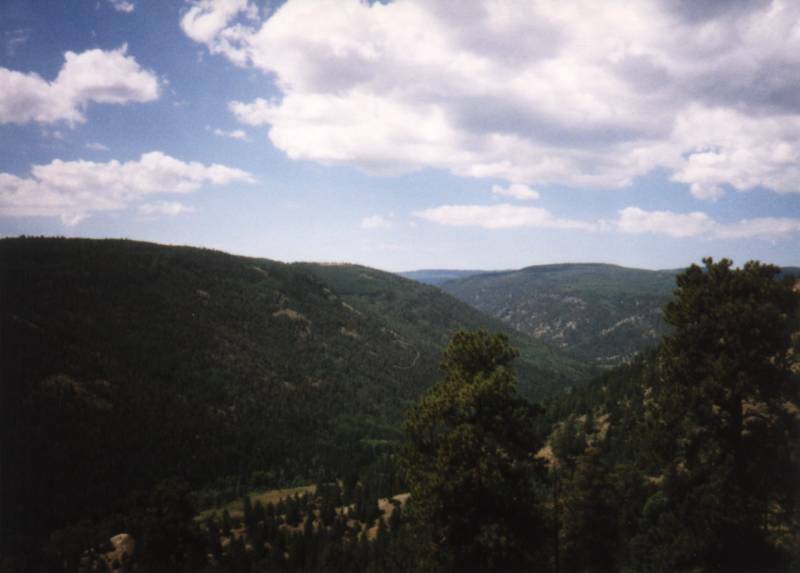 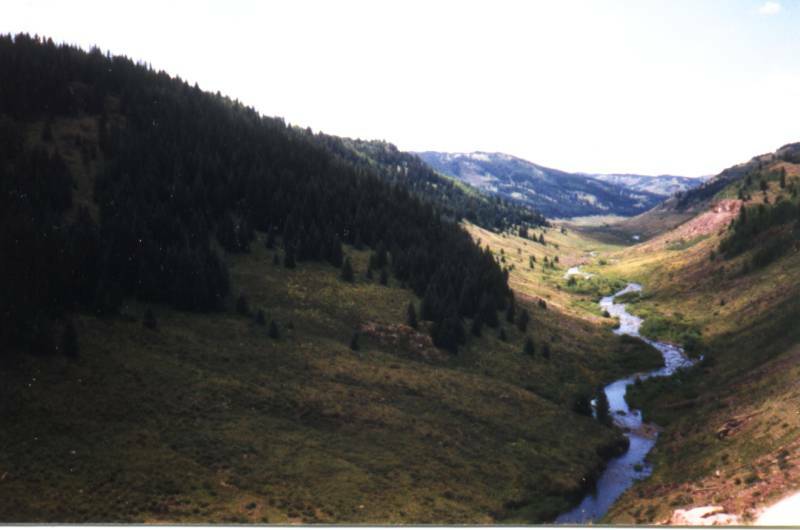 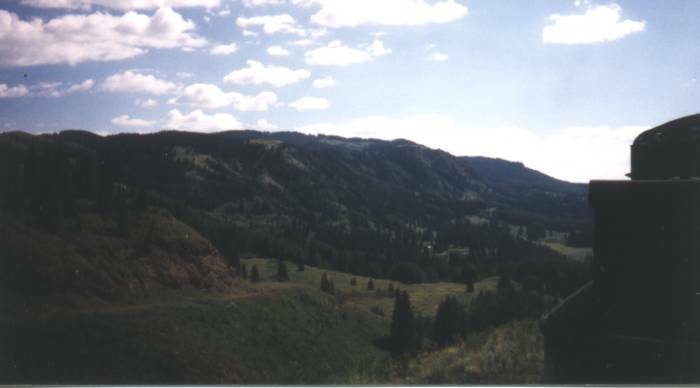 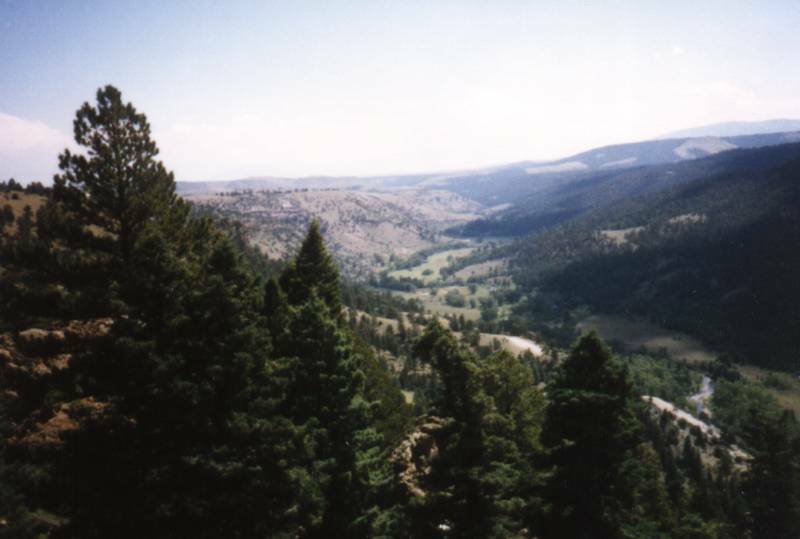 The scenery is open, expansive, natural. 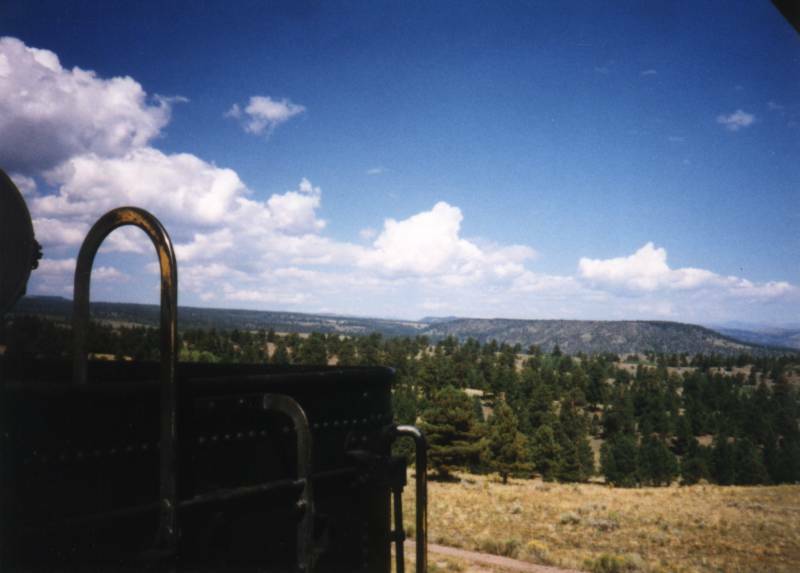 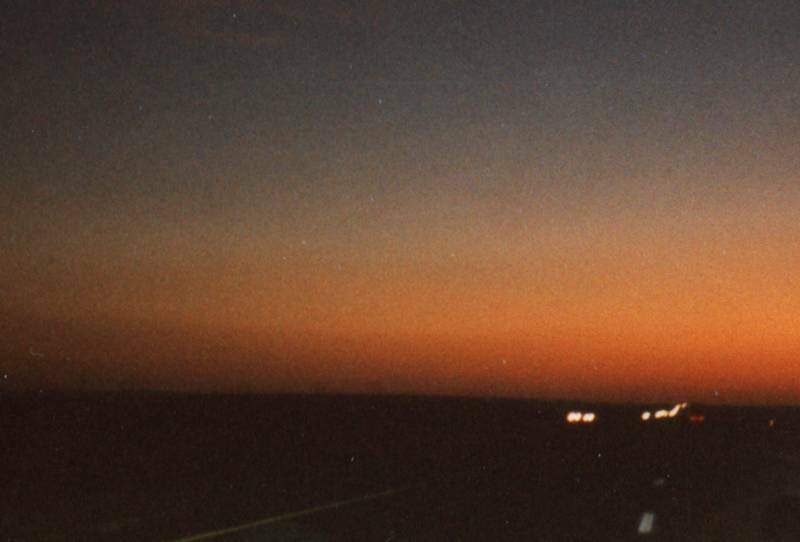 There will be little in regard to signs of people enhancing the timelessness of the trip - you see what those in the 1880's saw. 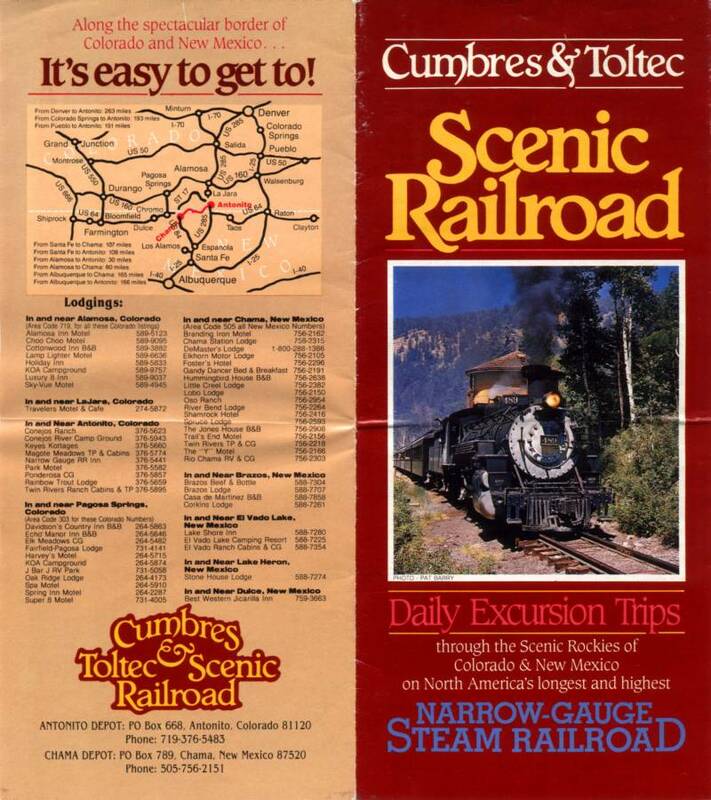 I've now traveled this line twice. 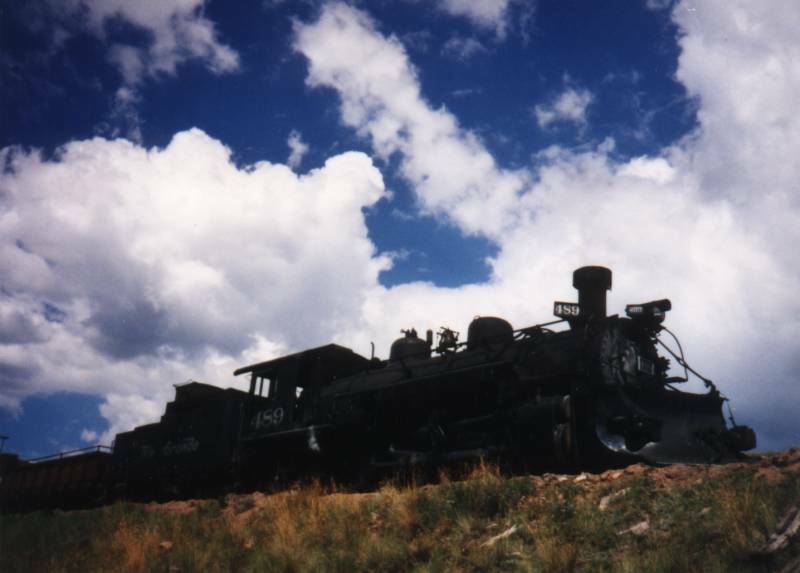 The second time, with Dad, was in the Chama to Antonito direction. 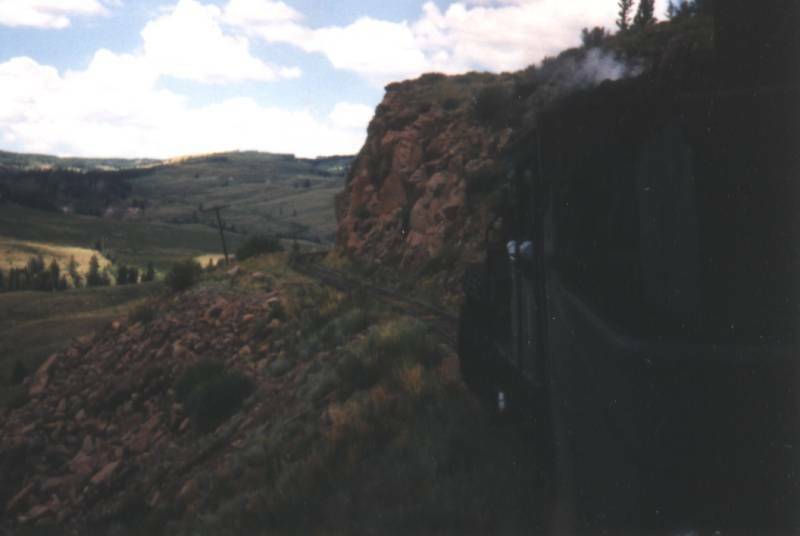 If you're only going for one ride I'd suggest the Antonito to Chama direction as the scenery builds and nicely captures your attention through the trip. 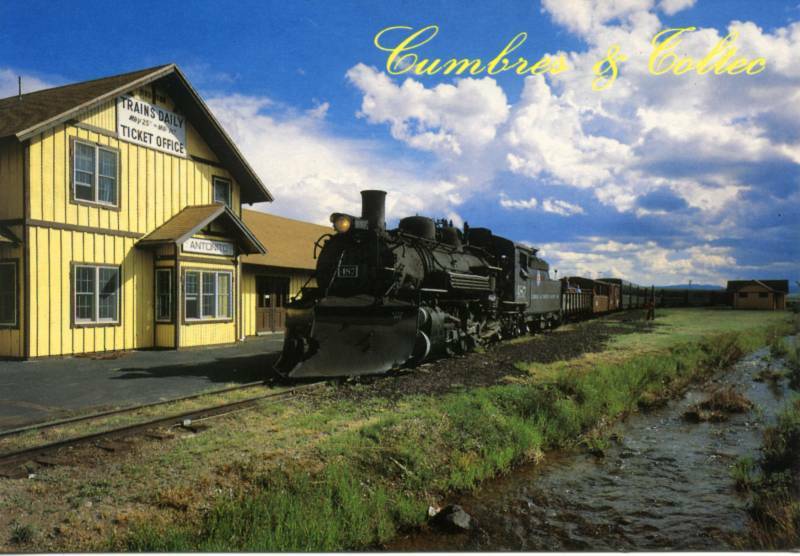 If you like rail yard / engine house operations do plan some time for Chama as the facilities there are extensive in comparision to Antonito. 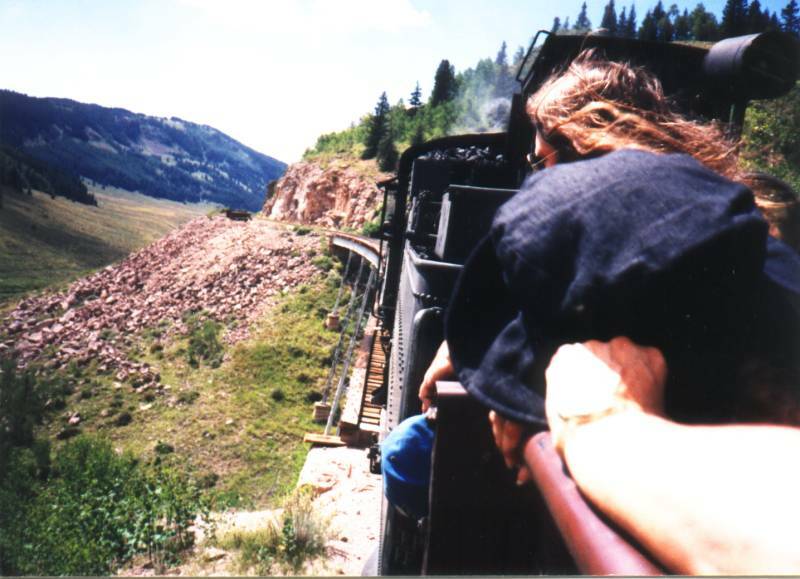 It is a special trip. 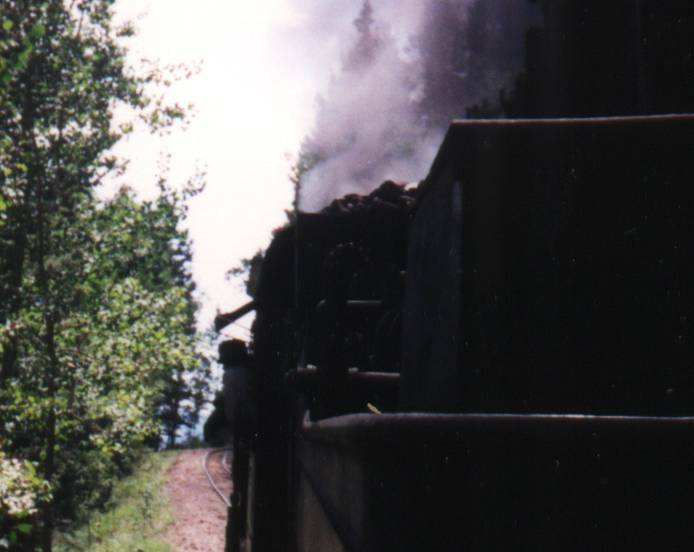 You could enjoy it for any or all reasons - the relaxing pace, the historic nature, the steam & smoke. 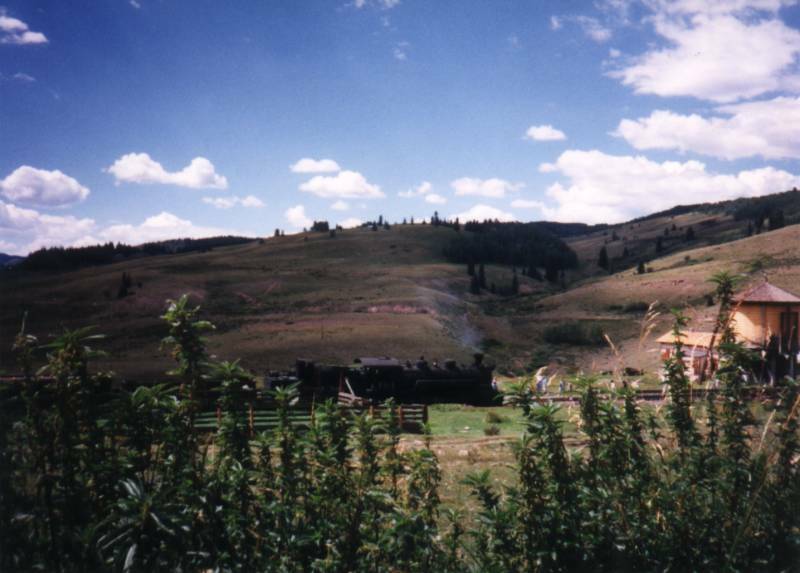 From the Osier lodge (lunch). 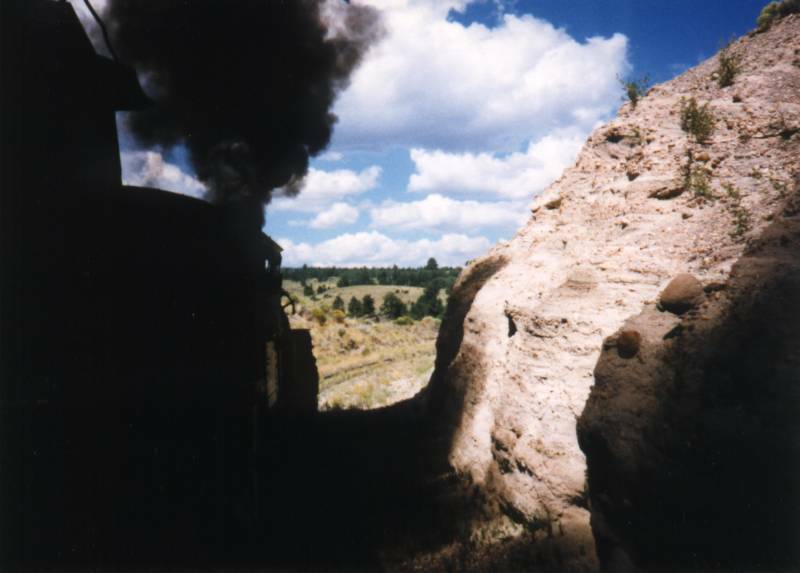 East-bound train approaching with a whistle echo across the valley. 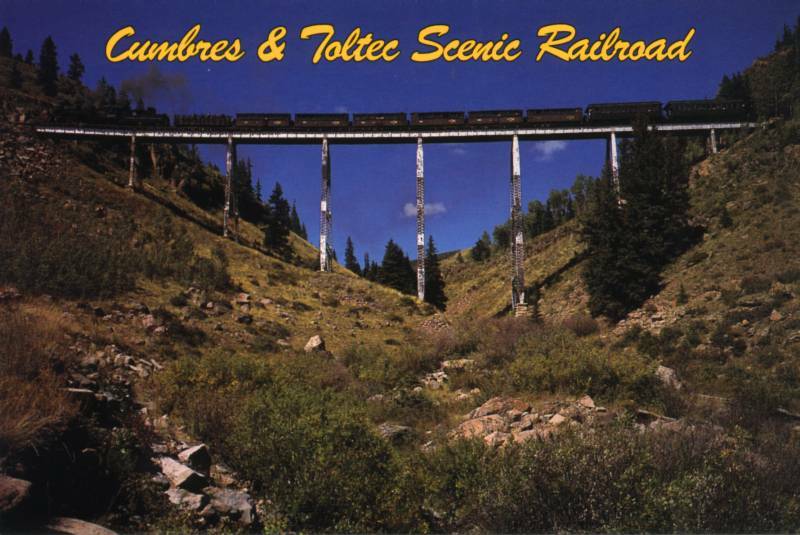 Cumbres & Toltec Scenic Railroad on Lobato Trestle between Chama, New Mexico and Antonito, Colorado. 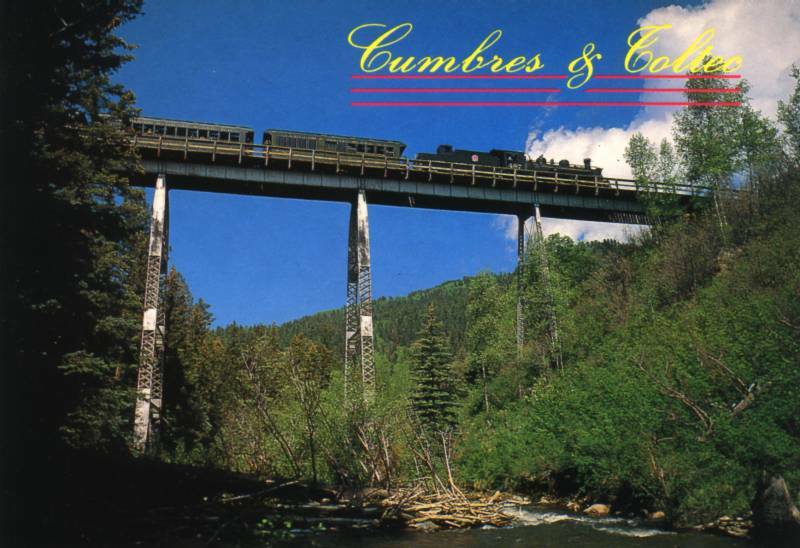 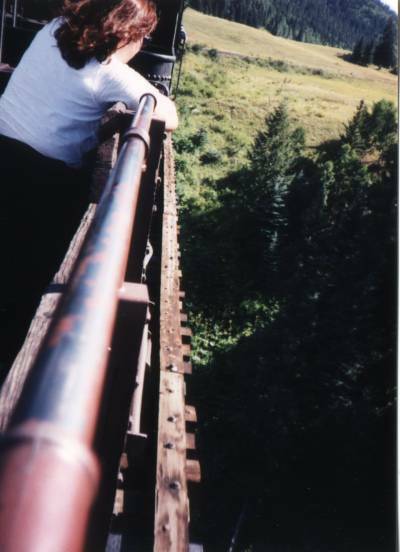 Cumbres & Toltec Scenic Railroad on Cascade Trestle near Osier, Colorado. 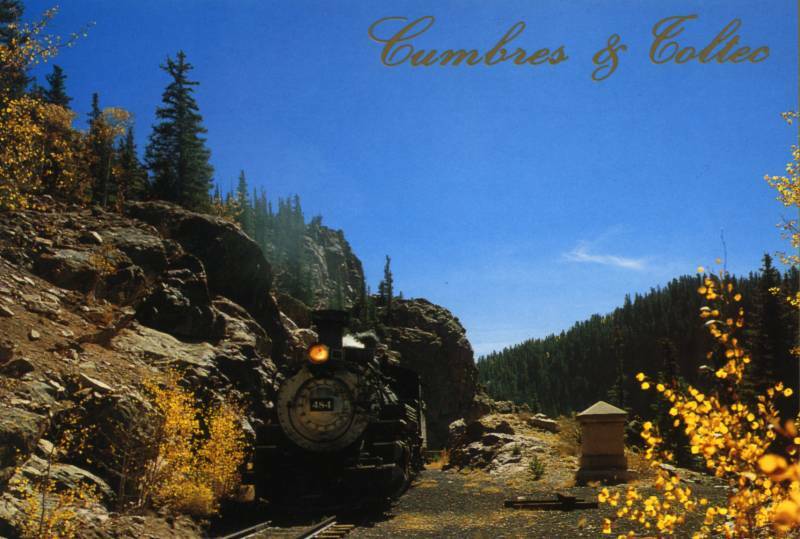 Cumbres & Toltec Scenic Railroad Passenger Train at a water stop on the scenic tour from Antonito, Colorado to Chama, New Mexico. 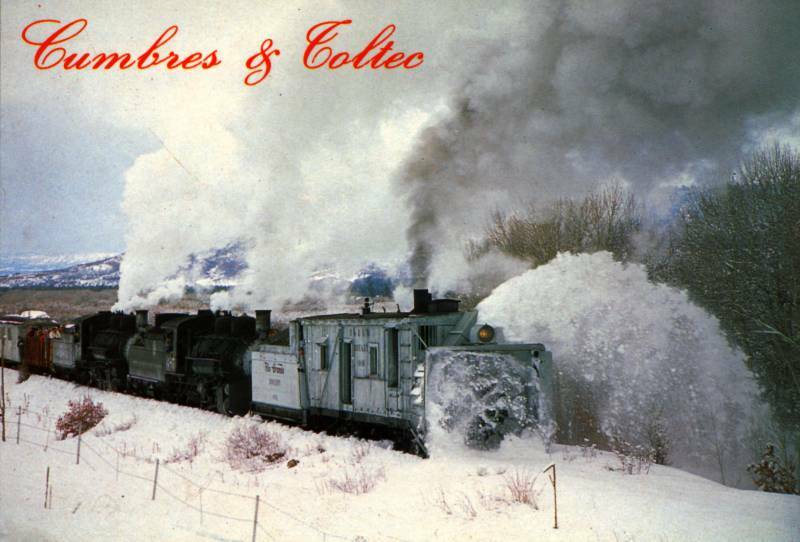 Cumbres & Toltec Scenic Railroad using a rotary snow plow. 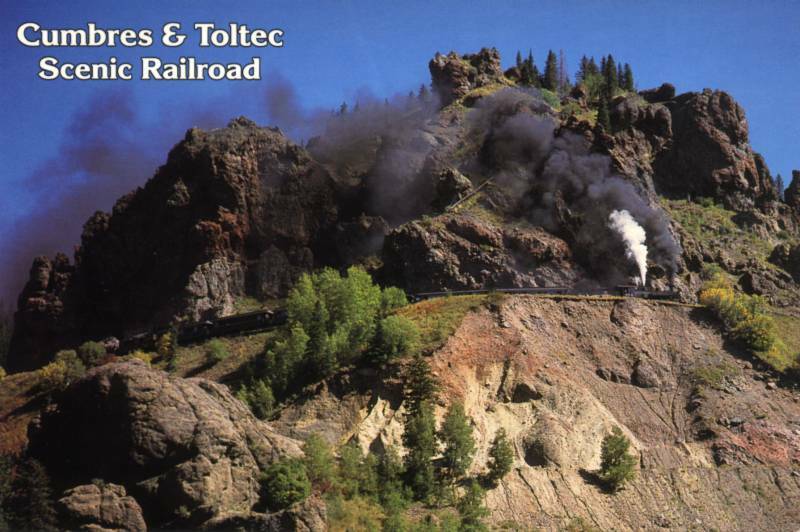 Cumbres & Toltec Scenic Railroad at Toltec Gorge Tunnel. 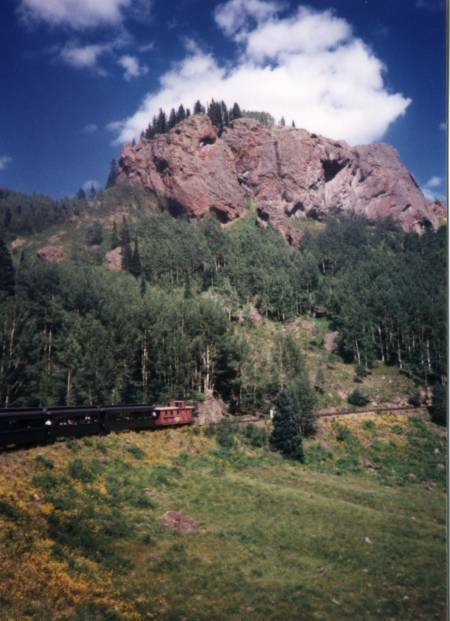 Also shown is the Garfield Monument. 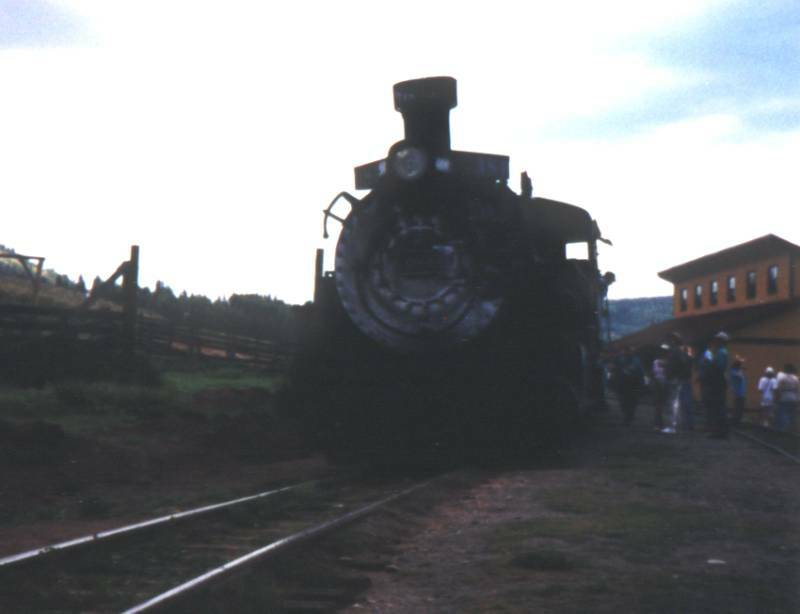 Denver and Rio Grande narrow gauge 4-6-0 number 168 was manufactured by Baldwin Locomotive Works as #6670 in 1883. 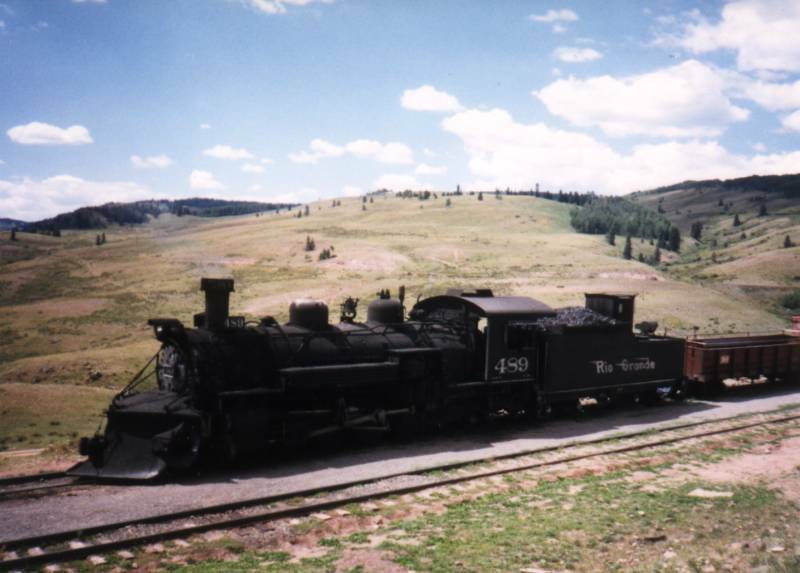 It weighed 56,550 lbs. 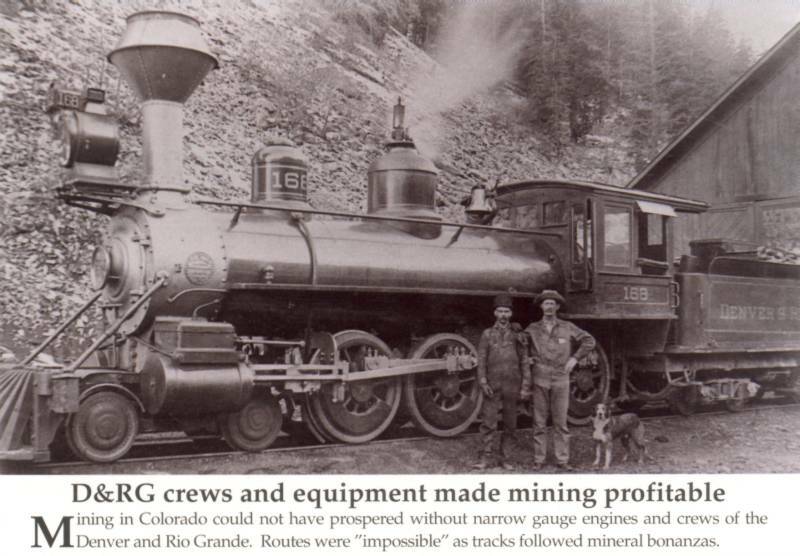 and its 45 inch drivers put forth a tractive efford of 11,590 lbs. 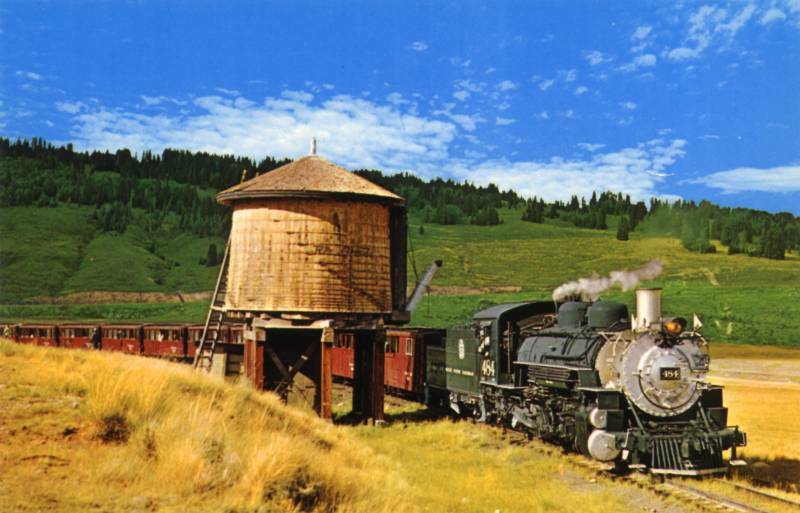 One of two originally delivered with diamond stacks, it was donated to Colorado Springs in February 1938. 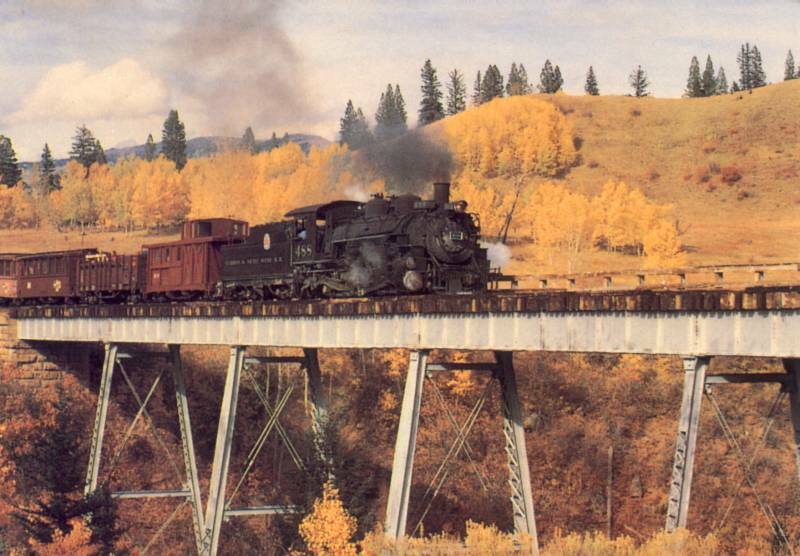 Lobato Trestle at milepost 339.75 was completed December 15, 1880. 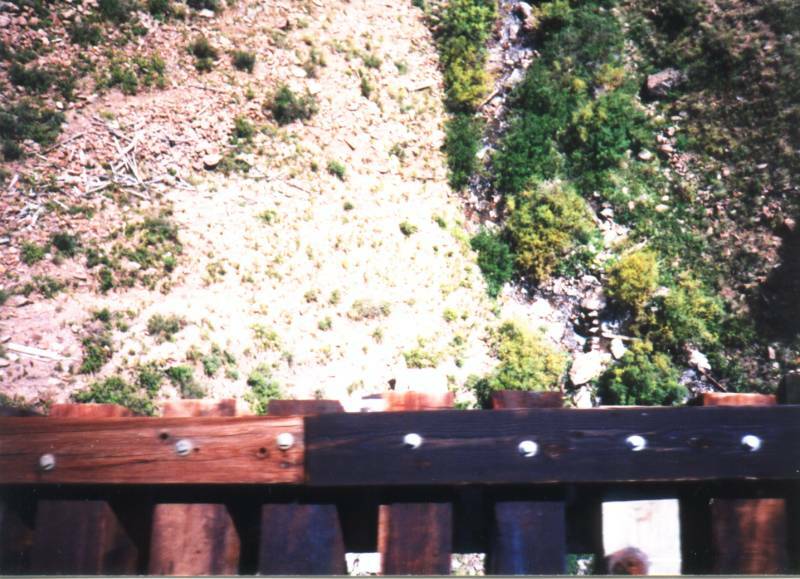 Made of iron, it was 100 ft. high and 340 ft. long. 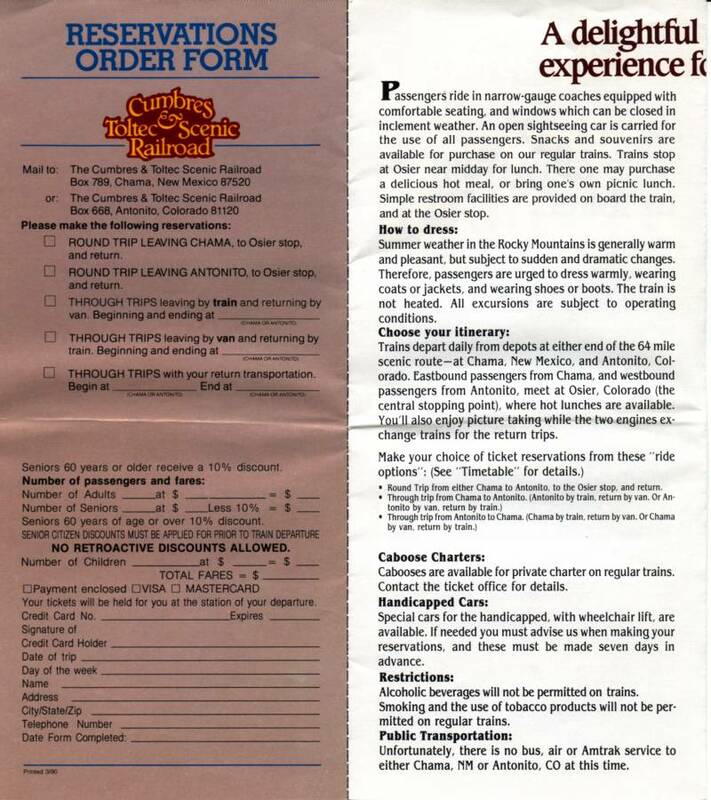 Rebuilt to standard gauge specifications during the 1920's it continues in use by C&TS trains. 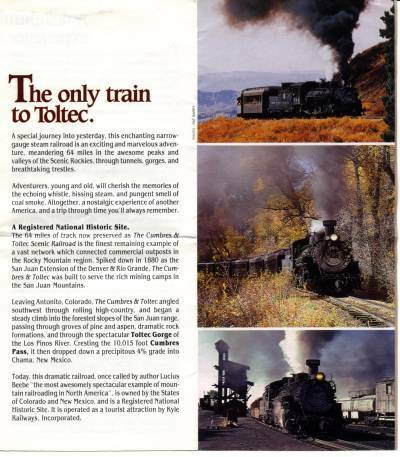 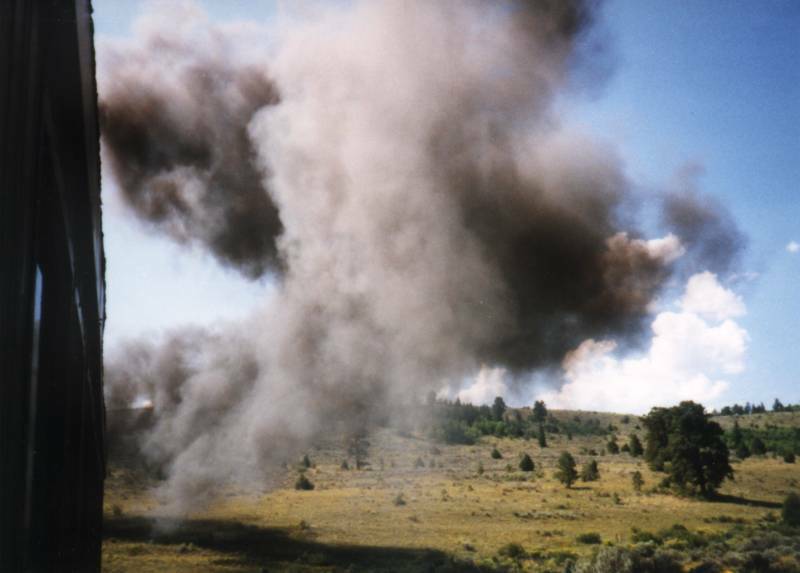 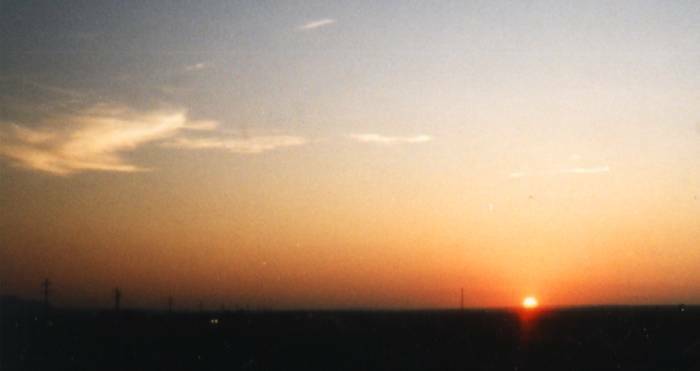 The name comes from Bartholome Lobato whose family moved to the area from Santa Fe after 1695. 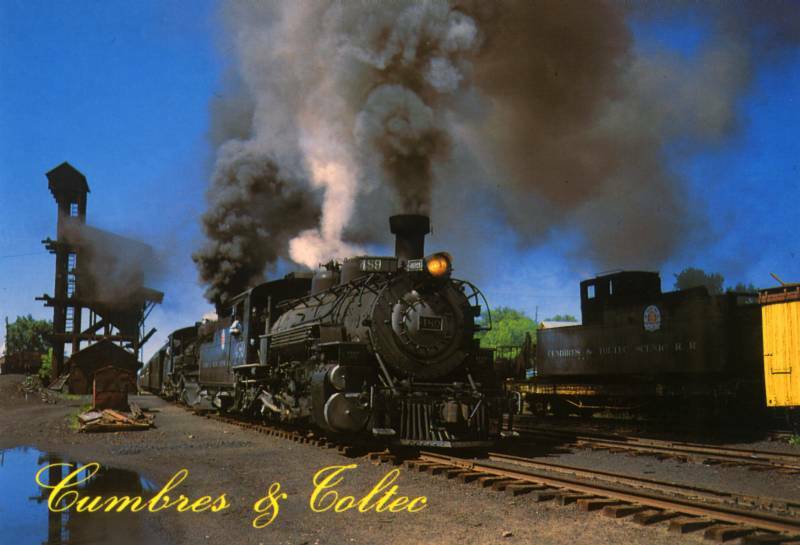 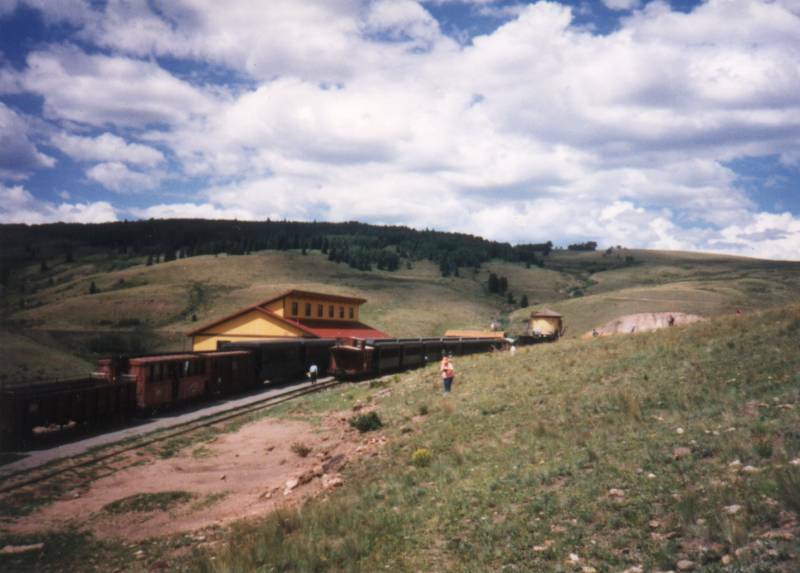 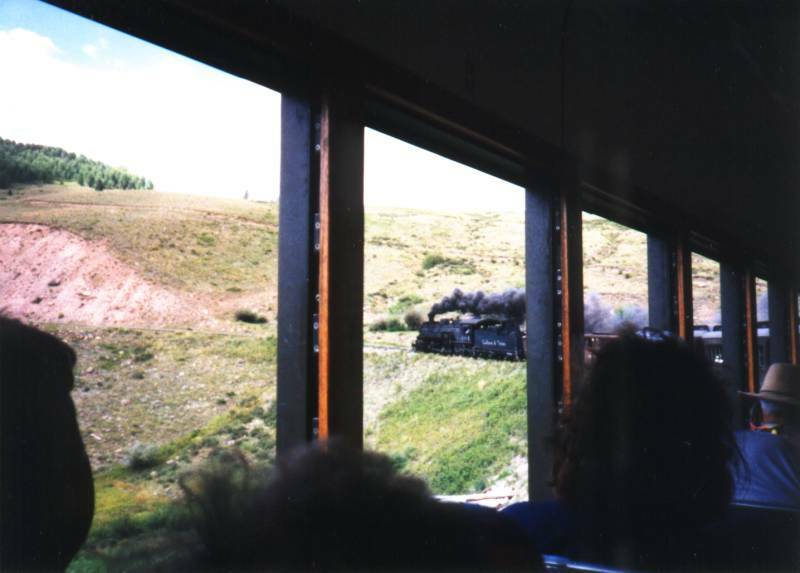 The Cumbres & Toltec Scenic Railroad at the Antonito depot. 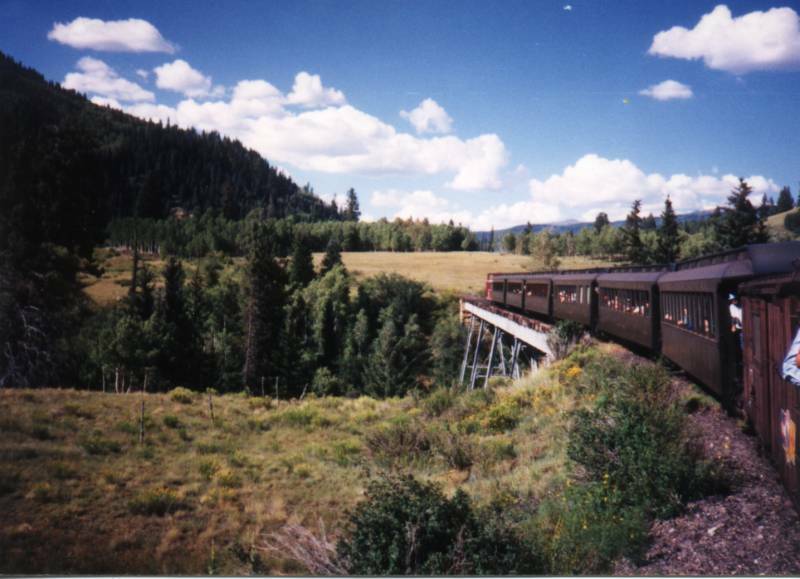 The railroad runs between Antonito, Colorado and Chama, New Mexico.